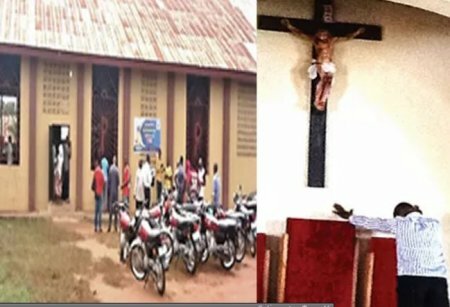 Saint Augustine’s Catholic Church, Nenger, Markudi, Benue State, Nigeria, yesterday became a centre of attraction as scores of people, Christians and Muslims trooped in to catch a glimpse of the ‘image’ of Jesus Christ. Witnesses at the church, located behind Government Model College, Makurdi, said the image, which was a carbon copy of the structure of Christ when he rose from death after he was crucified and buried, had on its head a crown, while the entire body was glittering, like precious stone. It was learnt that the majority of people surging into the vicinity of the church came from the community while others were from the 23 local government areas of the state. They were all eager to see the image themselves. It was also learnt that many Christians and non - Christians alike, on sighting the image which was accompanied by a bright light that overwhelmed the entire church, moved close to it and placed their hands on it. They were shouting: “Jesus save me," "Jesus the son of God, have mercy on me.” One of the parishioners, Mr. Emmanuel Hembenkaan, told New Telegraph that he was shocked when he saw the image. He said the image was seen in the church for the first time since the church was established. The Catholic Priest in charge of the church, Rev. Father Celestine Tyowua, declined comments, saying he would address the media after receiving approval from the Bishop of Makurdi Diocese, Wilfred Anagbe.